The term ‘Tadka’ refers to ‘Seasoning’. 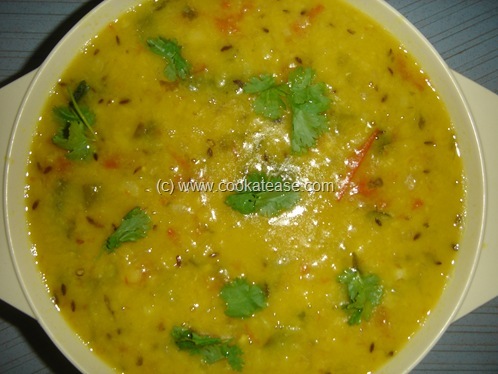 Toor Dal Tadka is very light and cooked often in our day to day cooking. In north India, mostly grams are cooked separately. In south India we cook mostly by mixing with vegetables. Red gram is known as ‘Toor Dal’ in Hindi and is known as ‘Tuvaram Paruppu’ in Tamil. 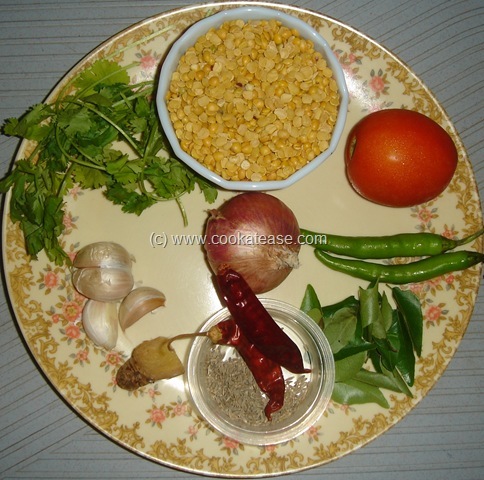 This red gram is used to prepare Sambar and Kootu varieties. Red gram is very nutritious. After cooking without spices, the water which is above the dal is filtered and given to infants above 6 months. Here I prepared a simple Toor Dal Tadka. 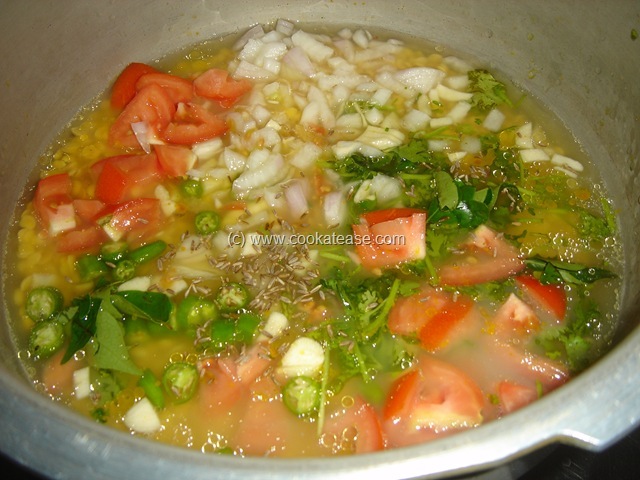 Chop onion, tomato, garlic, ginger, green chilli, curry and coriander leaves. Wash and put red gram in a pressure cooker with 2 cups of water; add few drops of oil, turmeric and half tea spoon cumin seeds; add the above chopped items; cook for two to three whistles and allow it to cool; add salt, mix well and do the seasoning. 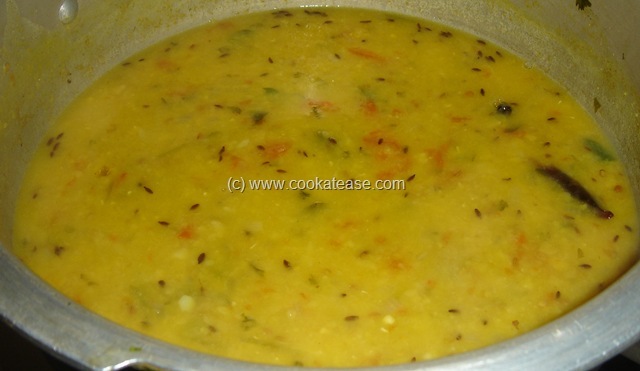 Toor Dal Tadka is ready. Garnish with coriander leaves and serve with plain rice or chappati. Seasoning with ghee tastes good. This post is part of the event “Steady Pulse – Bean & Legume Recipes You can Count On” hosted by In My Box. Ultimate comfort food for all-times!! 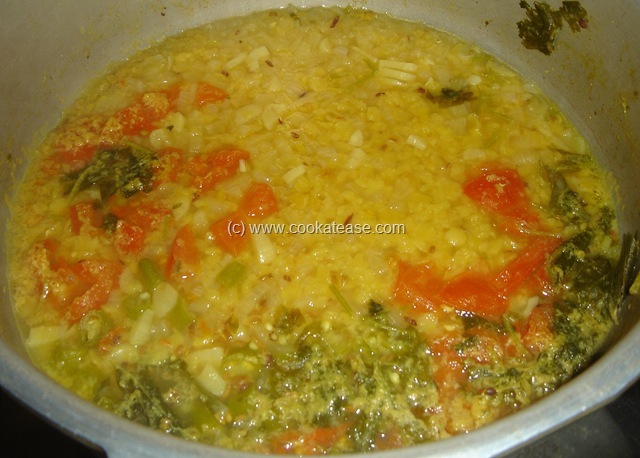 I never cook the veggies together with dal, Should try it next time!! 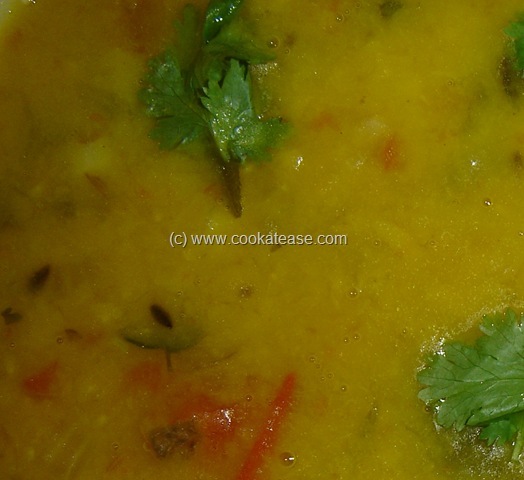 lovely dal, love to have simple dal and rice anyday….real comfort food…. Awesome comfort food, it’s exactly how we make it too and it tastes awesome.